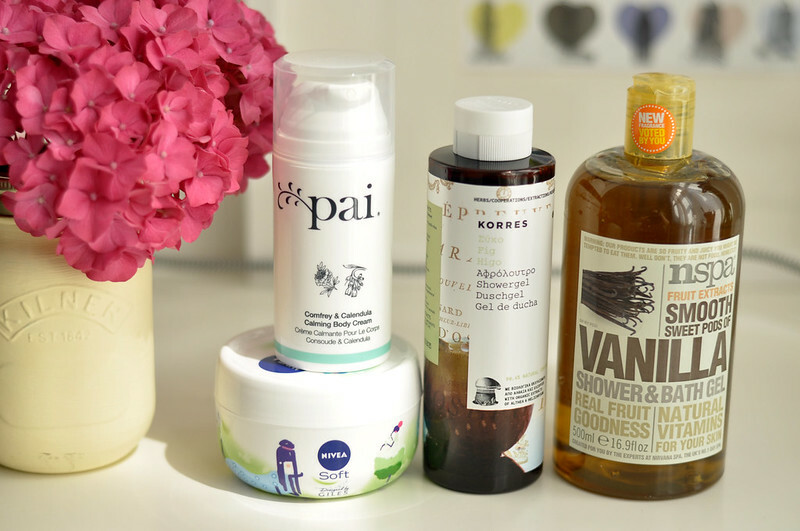 Pai Comfrey & Calendula Calming Body Cream | £22 // Pai is a brand I want to try more products from so I started off with the hand and body creams. Calendula is something I try and find in my skin and body care as I know it agrees with my skin. This cream really reminds me of the Weleda Calenulda Body Cream but a slightly lighter version meaning I can use it all year round as it isn't heavy feeling on the skin. I don't know if I got a faulty bottle but the pump doesn't really work very well. It works enough to be able to use the product up the end but with ease. Nivea Soft | £4.28 // This tub brings back so many memories of being a teenager as it's one of the few products I can vividly remember using apart from Liz Earle Cleanse & Polish. Just the scent a lone brings back memories. The cream itself is really nice and I love the simple packaging. Korres Fig Shower Gel | £8 // This is probably my all-time favourite shower gel and I’ve been through countless bottles. The scent alone brings back so many summer memories and it’s a nice one to use in the winter when it’s cold and dark outside. It has the typical fig scent but also it reminds me of sun tan lotion. The shower gel itself is a dream to use as it feels very moisturising on the skin and lathers nicely. These shower gels are often found buy one get one free so I tend to stock up a bit when I run out. NSPA Vanilla Shower Gel | £4 // I’m a huge fan of these shower gels from NSPA and have probably tried all of the different scents available over the years. They’re cheap and usually on offer in Asda so I can just pick them up while doing my weekly food shop. There’s also a lot of different scents to choose from so you’re bound to find one, or five, that you like. I’m not a huge fan of vanilla scented products unless it’s combined with another fragrance but I like this one. It’s vanilla but not too sickly sweet. These shower gels also make great bubble baths and it doesn’t feel like you’re wasting a lot of product as they’re so cheap. I have recently discovers Korres, it seems like a great brand!